Unlike the previous two volumes, I didn’t think that this one plummeted in quality after the midway point. Yes, it’s still a fairly inconsistent read, but it never took a nosedive. There are a lot of artists who use vibrant colors when darker, earthier tones would’ve been more fitting and there are writers who just couldn’t find the right voice for the characters. Bane shows up and his sections are written by Larry Hama, who is famous for his work on G.I. Joe. He also wrote the last chapter of the previous volume which was a story I absolutely hated. His work in this book isn’t much better. I feel like he just didn’t quite grasp the story or the world these characters inhabit. His dialogue in particular is really, really bad. Hama’s prose are alright, but the dialogue is cheesy and unnatural. People just say what they see even though the reader is looking at it happening thanks to the art because, after all, it is a comic book. Or you’ll see characters give long soliloquies about what they are going to do in the future–which would be fine if the words coming out of their mouth were not so artificial. Bane is probably the worst about this. He details his entire plan to himself while referring to himself in the 3rd person. It’s bad. I remembered him being much more threatening and intelligent in this saga but I’m obviously recalling the novelization by Greg Rucka, a book that I’ve referenced in each review. I think it’s pretty clear now that I recommend everybody check that out. I think I might even seek it out and re-read it again, it’s been a very long time. Folks who pick up the No Man’s Land books expecting a Tom Hardy Bane are going to be very disappointed and might even find themselves confused at how Nolan and company had any faith in this character in the first place. Bane’s drawn ridiculously as well. It’s not human anatomy. He has the body of a bus and the head of an apricot, I’ve seen The Hulk and The Thing drawn with more reasonable proportions. And there was one line that really bugged me when I was reading this book. He made some little girl walk through a boobytrapped corridor before him and he sad “You are my Judas goat.” –I don’t think he understands what a Judas goat is. I think he meant guinea pig. A Judas goat is trained to lead other goats to slaughter but then it survives to do it again and again and again. Bane is sending this chick in to test if the deathtraps are still operational–he’s sending her in to die in his place. Oh well, at least it got me thinking about how “Judas Goat” wouldn’t be a bad band name if it wasn’t for Judas Priest already stealing the name’s thunder. “Stolen Thunder” wouldn’t be a bad band name either but maybe it would be better used as the name of like an autobiography…what if somebody did a story about Maxie Zeus in which he is reformed and writes an autobiography called “Stolen Thunder”–this is how my mind works when it’s in Batman-mode at 3 in the morning and… I’m actually going to leave this in the article. Anyway, enough about Bane! Let’s talk about the other big standout performance of volume 3: Harley Quinn. She’s a fan favorite, and I’m happy to say she’s written well here by Bronwyn Carlton. Her two part story “The Code” about her trying to get a little respect and much needed attention from the Joker by following rules laid out in a magazine she found is just the sort of storyline you’d see in say an Animated Series episode. I know I’ve complained about detracting stories being littered throughout the NML saga but when a story is good, a story is GOOD. And I had fun reading this bit. The only drawback I’d say is that Harley pops up out of nowhere. We’ve seen the Joker in both of the previous volumes which stretch for almost 1000 pages and there’s never been any sign of Harley Quinn being anywhere near Joker. Now it seems like she’s been hanging on his arm the whole time and everyone in Gotham is familiar with her existence. Oh well, you’ll overlook it quickly. I did anyway. Of course by adding even more larger-than-life characters to the mix and not advancing the plot enough over the past two volumes, a few other character end up with less attention than they deserved. Nightwing, who had one of the more memorable adventures from volume 2 is missing from this installment. Gordon and the Blue Boys, who were hands down the most riveting aspect of volume 1 play little to no role in this volume what so ever. In fact, the central plot of restoring Gotham moves so slowly that No Man’s Land doesn’t feel like it has much of a point anymore. It doesn’t feel like anyone is looking at the bigger picture. There are plenty of stories in which someone is trying to find medicine, gasoline, fresh water, or trying to traffic a few innocent lives out of the city but no attempt is really being made to restore Gotham to its former self. Had the story kept the momentum it had with Gordon and the Blue Boys in Volume 1 then NML could have been wrapped up in 2 volumes and been the most epic Batman story of all time. Instead we have dozens of different writers and artists taking a crack at the story but none of them know what to do with it or how far they can go with it. When I was a quarter of the way through this book I realized that the whole saga had lost any sense of urgency. The smaller stories are definitely getting better, however. Seeing Robin try and take on Killer Croc and his gang alone was fun. Batgirl’s desperate attempts to defend a gas station from marauders was a really great moment for her. Heck, there’s even a Superman story here–SUPERMAN, who I could not hate more for being included in this saga, is given a chapter all his own that was actually very entertaining. If they ever do an animated movie of this I don’t want Superman anywhere near it, but still that story by Devin Grayson from Batman: Shadow of the Bat was well done and if more of these short stories were of that calliber then I would give each of these volumes a much higher score. One of my biggest complaints with No Man’s Land Vol. 3 would have to be the severe lack of maps or time/date stamps. The other volumes did a great job of showing the reader where the gang territories were, how they had changed, and how many days have passed since No Man’s Land was declared. Here, I don’t know how much time has passed since volume #2 and I don’t know who owns what territory anymore. It should be summer but some writer/artist teams show characters wearing heavy coats. I thought that the power had been cut off—twice—but there are characters watching the mainland’s evening news. Could they be using generators? I thought all the fuel was used up but it seems like every 100 pages or so somebody lucks into a fresh canister. Again, there’s never any sense of urgency. NML is perfect for bringing together characters that you would never see interact otherwise. 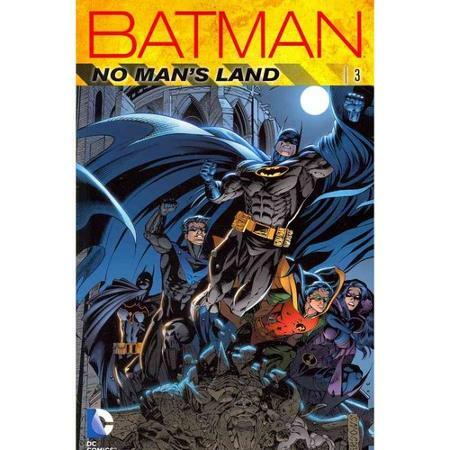 No Man’s Land Volume 3 is a fine example of that. How else will you see Killer Croc and Penguin together in the same scene or Rat Catcher and Mr. Freeze teaming up? I had a better time with this installment after the fairly weak volume 2, but this saga desperately needs to pick up the pace. This is definitely better than No Man’s Land Vol. 2 and although it holds up better on its own than the other two books and has a nice structure what with it beginning and ending on Killer Croc, Volume 3 is still not quite as good as No Man’s Land Vol. 1.